A Counselor of Real Estate provides intelligent, unbiased real estate advice that achieves the best results for a client or employer. 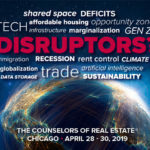 As the most respected real estate specialists in the industry, Counselors work on the most complex and important projects, effectively run real estate businesses, and are known for innovation and creative problem solving. Search our member database for CRE's who service your region or live nearby, as well as by specialty. Use any combination. As a public service program, the CRE Consulting Corps is designed to provide access to the highest level of expertise in designing effective strategies for sound real estate solutions. Each year, The CRE External Affairs committee summarizes the broader structural issues that will define the real estate industry through our list of the Top Ten Issues Affecting Real Estate. We welcome all individuals that have the requisite combination of talent and experience in the real estate industry to apply for membership. The next deadline for submissions is August 19, 2019. Learn more about CRE members. Visit our new Member Spotlight page. Possible members are subject to a thorough review process. Read more to find out if The Counselors is right for you.